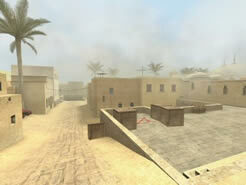 De_dust2 is the most publicly played map in Counter-strike: Source. This is largely due to the fact that each team seems to have equal opportunity and the map seems to be balanced fairly well. In league play however, it seems to be more biased towards the Counter Terrorist side. A solid CT defense can shut down an overall better team on the offensive Terrorist side. Although there are exceptions to this rule; usually a lop-sided win on Terrorist side is caused by an 'exceptional' team competing against an inferior one. A good example of such an exception happened in professional gaming when Birmingham Salvo beat 4kings 14-1 on Terrorists at i33. The image below shows the different areas of the map; they are by no means the "correct" names, but they are the names my clan and I commonly use. There are two main access points to Bombsite B. One is through the tunnels and the other is through Mid Double Doors. Bombsite B is probably best defended with the very common setup: two players in B site and another player watching Double Doors up to Mid (ready to rotate). The two players in bombsite B are usually positioned so that one of them is at the back by the Boxes and the other is closer to the tunnels near B Car. This allows for a counter attack of sorts when being rushed; One of them flashes when they hear the enemy rushing and then they attack from 2 directions while the enemy is still blind. As a Terrorist you can hinder this tactic by throwing flashes over the wall from Mid as a properly thrown flash will completely blind any CT defenders in B site. This is useful for getting the bomb down quickly and safely while rushing into the site. 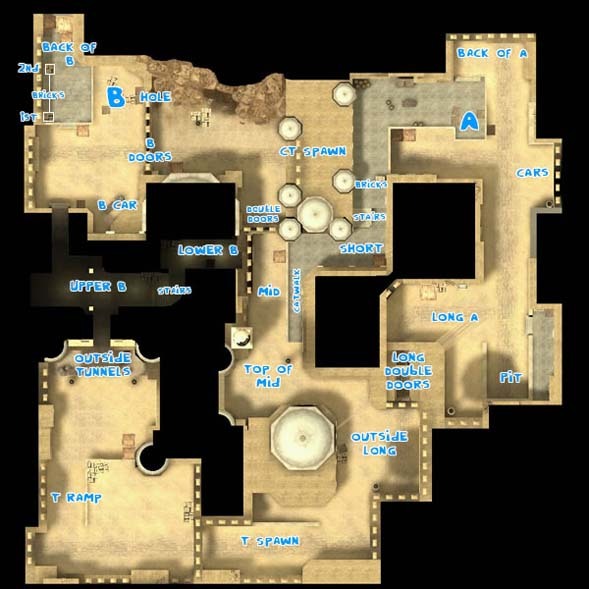 Since Mid is such a key bottleneck in this map, it's important that the Mid player (perhaps the strongest player on the team) holds the position down and makes all necessary calls over Ventrilo or Teamspeak as to the Terrorist's position. While defending Mid, if you suspect or hear Terrorists in Middle/Ramp area, throw flashes over or through the Mid Double Doors. This will totally flash any Terrorist's trying to setup a rush along Catwalk or into Mid and is a very effective Counter-strike tactic to 'keep them at bay' . There are three access points into bombsite A, Short, Long and through Mid from CT spawn. Short A is the riskiest way to attack on this map because you are vulnerable to snipers from Mid when you run along catwalk. To make matters worse when you get up to the bricks/stairs area you are vulnerable to being "nade bombed", as a cat rush is very easy to spot.Aside from those issues, a catwalk rush can be very effective. An early pick on the CT's Mid defender or by smoking Mid (doesn't always work) may allow you to get along catwalk safely.If you are successful in taking out the CT at Mid you can pretty much guarantee that you can get the bomb down at A (assuming you are quick enough). Remember to check behind the bricks at the top of stairs; Anyone hiding there can easily take out a few of the attackers with an unfriendly welcome of rifle/smg fire. Another thing to note about short A is that you can throw flashes over ALL the buildings there, so you can flash long A or top of mid quite easily and safely. Going Long A can be risky business too, if you straight out rush it. In a match I played a few months ago, the players watching A managed to kill four players and get the last one down to 20hp from a double nade at the very start of the round. When rushing it, it's best to wait for any nades or flashes the defenders throw in, then throw your own flashes over the top or through the roof on the inside and rush it. When rushing in, check everywhere. Check to the left of the Door, check Pit, check to the left behind the Big Box, and check to the right next to Pit before even looking down to A site; not looking can be the downfall for a good rush. Although Dust2 is a timeless ancient, there are plenty of new strategies that can be dreamed up. I only covered some of the basic strategies which should be a good foundation for any newer clan. Got more strategies? Comment away!